Trucks are the backbone of our country. I’ve never been a “truck guy”, but recognizing them for what they are is an acknowledgement and appreciation of them. How the heck does the rest of the world get by with little vans? And what do they tow their campers, boats and other recreational vehicles with? 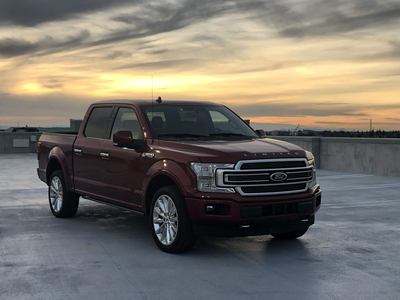 Ford’s F-150, the bestselling vehicle in the United States, and staring price is just over $28,000. This 2019 Limited 4x4 Supercrew model starts at $67,135 and features the twin turbocharged 3.5 liter Ecoboost V-6 engine producing 450 horsepower and 510 lb-ft of torque, class leading among gas and diesel full-size pick-ups under 8,500 lbs. gross vehicle weight rating. 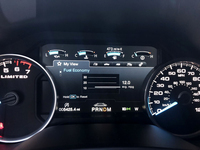 It’s mated to a 10-speed automatic transmission and I’m writing to tell you that it sounds good, more V-8 sounding than V-6, confirmed outside the truck, and not just artificially piped into the cabin. Performance is impressive to the point of being fun with putting the pedal to the metal. 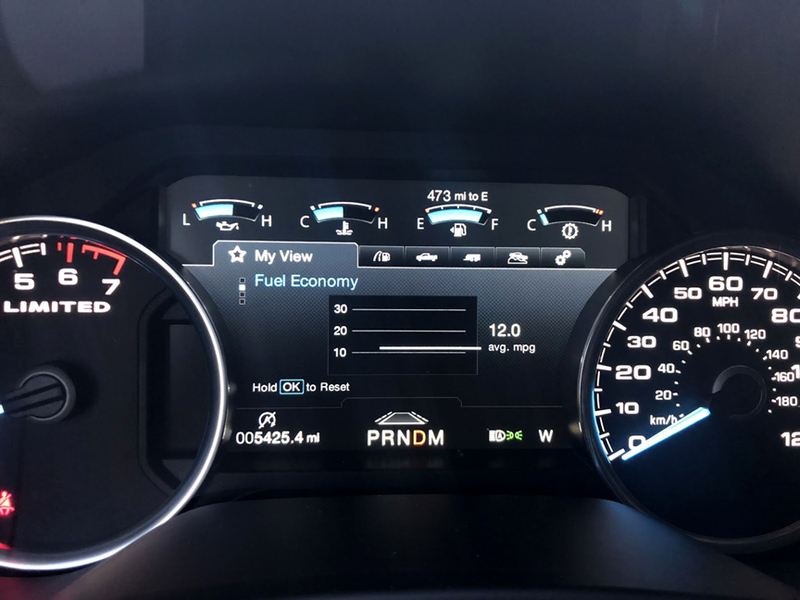 Looking at third party performance test results, Car and Driver did a 13.7 second quarter mile at 102mph, the second quickest pick-up they have ever tested, beating the Edge ST, the first SUV from Ford Performance recently reviewed. And the Raptor for that matter. Just as impressive, and equipped with the big 22” wheels with 275 series rubber, it stopped in just 168 feet. Honestly, that is spectacular for a vehicle over 5500lbs. Despite the mileage rating of 15 city and 18 highway, the 26 gallon tank provides plenty of range, and there’s an optional 36 gallon tank. A 170 mile round trip, almost all highway, saw 18mpg with much of the time at 75-78mph during which showed 17mpg at that speed. One notable observation was the adaptive cruise control was nearly perfect. Maybe it’s due to the higher mounting point of the sensors, but it is smartly programmed, didn’t rush up on slower traffic, kept an acceptable following distance and sped up smartly when a gap opened from a car moving over. Opening the one of the four doors reveals the automated floorboard appearing from underneath the truck which is really convenient. Just don’t walk into it shin first! When they retract, they make a satisfying and positive sound of engagement. I’d love to know what Ford did to assure their continued operation many years and miles down the road while subjected to the elements and road grime. Other automated features include remote start and tailgate release from the key fob. Once the tailgate is opened, a center button releases a pull out and drop-down step along with the yellow tip of a rod that can be pulled out and stood upright to assist with accessing and leaving the bed of the pickup. Absolutely brilliant in its simplicity and execution. Entering the Limited edition, you’re greeted with two tone leather covered seats and leather dash with a well thought out gauge display and easily figured out infotainment system with various display options. The navigation has a funny quirk that this and the previous Ford had. When you drive right past the front door of your destination, Home Depot of course, it still doesn’t know you’ve arrived until a little later. Thank goodness the system overall is very easy to use because if you only have a vehicle for a week, a 400+ page owner’s manual can be a significant commitment in a short amount of time. Alternatively, the Apple Car Play is works great as it always should. A huge, wide, two level center console offers a lot of storage space, maybe enough for a laptop. 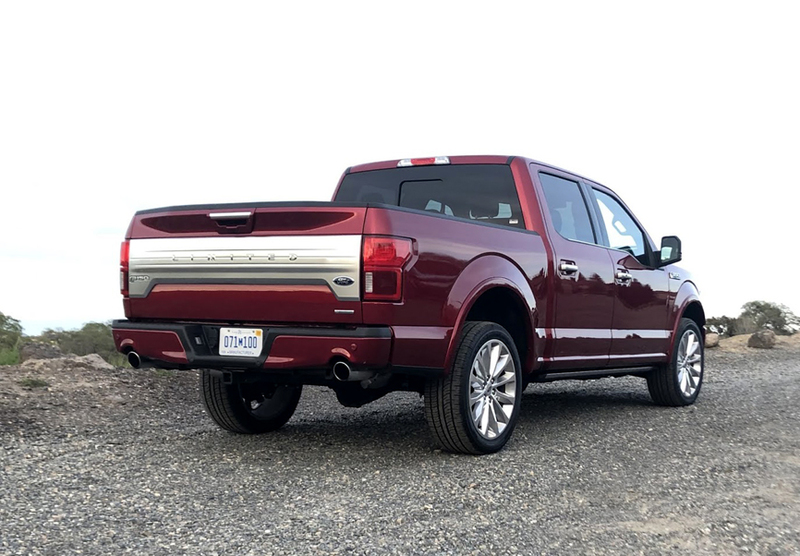 The seats are immensely comfortable for the long haul, but not hauling around a turn but that’s not unexpected in a pickup truck. The seats are also heated and ventilated, the term captain’s chair immediately comes to mind due to their size, presence and comfort. Oh, they have a massage function as well! The seats don't hide the shuddery, jittery ride but despite the movement being felt in the glutes, it's still very much a luxury vehicle. Besides the USB outlet, there is a 12 volt household style socket which the wife said is great for drying her hair on a road trip. How many Ford engineers considered that I wonder? There is also an outlet in back and a ton of legroom. Fitting your three big work crew members back there is a non-issue with the full-size rear doors. They only nitpick from the driver’s perspective is the location of the door lock and parking brake functions. Exploring various features, the center section of the rear window is powered and offers a nice ventilation option. Or to yell at your kids playing in the bed while you’re driving…. The sprayed bed lined offers lights in the side besides the top of the cab, as well as cargo tie down mounts. Loaded with technology and options, it is truly a luxury vehicle that happens to have full functionality. With a sharp red paint and chrome trim, it looks like it would be owned by a successful farmer, construction or manufacturing business owner, or executive of an outdoor product company. The problem with a truck is when you do truck stuff, it many times means you’re going to be busy with projects. Or in other cases, busy having fun.